Our Premium Aloe and Olive Oil Melt and Pour Soap Base has a light green color and clarity score of 9 out of 10. The ten-pound block makes (40) 4 oz. bars of soap and measures 12" x 11" x 2.25". This soap has a luxurious big bubble lather. Sorbitol, Propylene Glycol, Sodium Laureth Sulfate, Stearic Acid, Myristic Acid, Water, Sodium Hydroxide, Lauric Acid, Aloe Vera, Olive Oil, Yellow 5, Green 5. "Very easy to use soap base"
COMMENTS: I used this soap base to make some basic soap bars and some fancy soap flowers for a basket display. It was quick and easy to use. It took color amazingly and the scent was very nice. So far, all that have used the soap I made from this base have loved the feel of their skin after they used the soap. COMMENTS: So glad I ordered it. Works great, and I like the [pale green color} it is pretty. "Love the big bubble lather!" COMMENTS: This MP soap base is ah-mazing! I love the light tint of green. 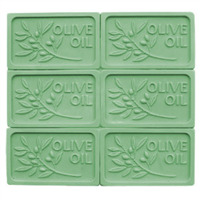 It is perfect for my mint soaps and I often add no coloring to it. The big bubble lather is heavenly. "Maximum 3% fragrance oil would mean like for 24 oz of soap, use 0.72oz of fragrance? (Not essential oil) Thanks!" "I made nice translucent soap with this last time but this batch turned cloudy after setting overnight. Now you can't see the embellishments inside the soap. 1) what did I do wrong with the second batch? 2) can I remelt this soap and use it again? Thanks! " Staff Answer It may have turned cloudy on this batch if you used different additives or a different fragrance. You can also remelt this soap and repour it but that will not reduce your current cloudiness.